One of my primary goals in writing the quintet was that it be clear and self-explanatory. Given this goal, detailed notes could be considered a distraction or even a failing, so please forgive the brevity of these. The piece is in four movements. The first is a cross between theme and variations on a ground bass. The second movement is moderate with some sense of humour. The third is slow and devoid of humour. The fourth is fast (and difficult). If this leaves you wondering what to expect, all the better. In the age of the not so innocent ear and the lost art of listening this sleeve note says it all. 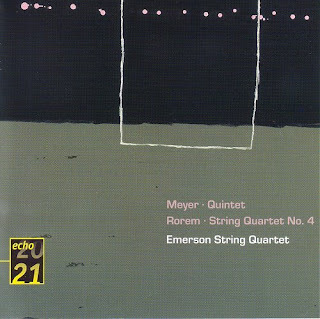 It was penned by Edgar Meyer for the 1998 recording of his Quintet for double-bass and string quartet which he made with the Emersons. The Quintet was released with a coupling of Ned Rorem's Fourth String Quartet, both premiere recordings, on Deutsche Grammophon's Echo 20/21 series. Edgar Meyer's credits include working with Garth Brooks and The Chieftains, the latter are also acknowledged by Jordi Savall as an influence on his recent Celtic Viol CD. The 1995 Quintet further blurs the boundaries between folk, country and jazz and its continuing neglect is a mystery. 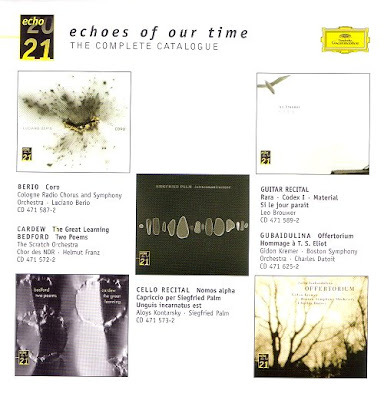 Deutsche Grammophon's Echo 20/21 series marked a final flourish of creativity by the label in the late 1990s before it was purchased by Vivendi and sucked into the all consuming vortex of Universal Music. Echo 20/21, with the strapline Echoes of our time, was clearly an attempt to mimic the success of Manfred Eicher's European Contemporary Music label. ECM's influence can clearly be seen in the thumbnail of the Sofia Gubaidalina album above. The artwork for the digipaks may have been derivative but Echo 20/21 released some very interesting and important music including Cornelius Cardew's The Great Learning, Takemitsu played by the music department of the Japanese imperial household and Boulez directing Ligeti. In an echo of our time, all the discs have been deleted in their original CD formats, to make room presumably for Sting's If On A Winter's Night. But they live on thanks to the download and you can buy Edgar Meyer's enchanting Quintet here. Thank goodness digital formats can keep great recordings from the past available. What a pity technology cannot do the same for the visionary thinking that created them. Bah, most of those Echo 20/21 discs were full-price reissues of recordings made in the 1960s and 70s, back when DGG actually did stuff. Even more galling, most of them (e.g. the Boulez - Ligeti) had previously been released as mid-price CDs in the "20th Century Masters" series. Same wine, more expensive bottle. This reminds me of an earlier post about the Entartete recordings - another wonderful project (also deleted) by a major label, Decca, also swallowed up by Universal. I don't know what makes me more upset... that such labels will never again undertake such ambitious recording projects, that the CD formats are deleted so quickly, or that these labels have been reduced to merely endlessly repackaging their back catalogue (oh, sorry, let's not forget new recordings such as the Sting album!)? Some were Ben. But not the CD that is the subject of the post - it was recorded in the Recital Hall, Performing Arts Center, Purchase College, New York in May 1996. Another favourite of mine in the series, Takemitsu's Quotation of Dream with Paul Crossley and Peter Serkin pianos and Ollie Knussen conducting the London Sinfonietta was recorded in 1996/7. TMH, thanks for that. It is nice to see a new face among the commenters, and even nicer to see one with a profile - that's appreciated and you are very welcome. No, thank you! Your blog was recommended by an old friend, who coincidentally now also lives in Norwich, and checking it out has become part of my daily routine. The Gubaidulina was previously released by DG at full price with one of MC Escher's "ribbon heads" on the cover. I know because it was one of the few DG discs in my collection to suffer from bronzing because of faulty manufacture by PDO in Blackburn (I assume PDO chose Blackburn because of the ample supply of holes there, which would have been useful for CD manufacture). DG were gracious enough to send me a new copy, this time issued in the 20/21 series. I think the last batch of new 20/21 CDs came out around 2004/2005; Unsuk Chin's portrait album was at one point, the only recording around of her music. A few earlier 'new (i.e. not reissues)' albums on the series included the Birtwistle "Theseus Game," which for a while was impossible to find in the US, Lindberg's Aura/Engine and the Wolfgang Rihm "Jagden and Formen," all worthwhile recordings. I believe Tan Dun's The Map and Tea were also tagged with 20/21, though they were both DVDs. It's really a shame that DG has basically given up on recording contemporary stuff, save the occasional Esa-Pekka album. We really do have to be thankful for labels like ECM, Kairos and Neos or even some of the US labels popping up recently for continuing to release stuff that would otherwise not see the light of day...though I wish those labels would be more inclusive. They're usually have a singular focus--such as continental modernist, or in the case of NMC, mostly UK composers. There's a disconnect; in such difficult times, it would be nice to have more dialogue and mutual support rather than more niche labels that don't have anything to do with each other. I love the diversity, but lament the fragmentation.